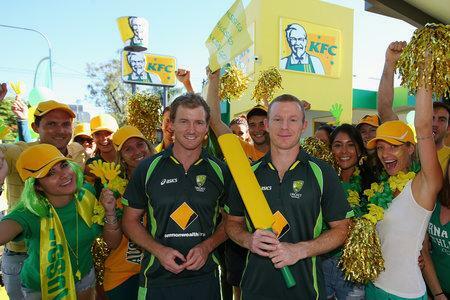 Five flagship KFC stores have been revamped with green and gold colours in support of the Aussie cricket team. The stores will remain in these colours throughout the 2013-14 cricket season. The Australian Cricket Team’s George Bailey and Chris Rogers, along with English cricketing legends, Graham Gooch and Sam Billings, were at the launch event held at the KFC Clayfield QLD restaurant.